1. What You Are Eating Has An Effect on RLS: There are so many reports coming out now connecting dietary habits with restless leg flare ups. 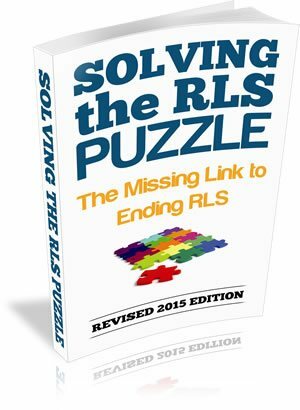 Learn what foods and what environmental factors could be contributing to your RLS by reading our free eBook “Solving the RLS Puzzle” which can be downloaded instantly on this site. 2. RLS is very common during pregnancy: Pregnant women experience RLS more than anyone. But, it has been found to be temporary and usually disappear after delivery. The exception to this is if RLS symptoms were present before pregnancy. If this is the case, pregnancy just enhances the severity of symptoms. Experts suggest that since developing fetus’ require large amounts of folic acid, the mother ends up depleting her supply if not enough is supplemented, causing RLS symptoms during pregnancy. It is also believed that a developing fetus will deplete the mother to be of a few critical nutrients such as magnesium and vitamin E and, if not replenished, will cause RLS symptoms. 3. Vitamin supplements are effective: RLS is said to be caused in-part by an iron, magnesium and B complex deficiency, particularly folic acid. A proven source of relief from RLS is to ensure you are getting adequate nourishment from these supplements. 4. As we age the condition appears or gets worse: This is obviously due to the breakdown in our bodies of vitamins and minerals as well as nerve sheaths that protect the nerve endings from harm. Digestion decreases with age meaning that assimilation of nutrients from the food we eat is lessened, causing certain deficiencies. 5. Exercise can help: Gentle stretching, yoga and Tai Chi are the most popular and most effective way to help relieve RLS symptoms. 6. RLS is a serious problem: Though it is not directly life threatening—it can cause major psychological issues and could be a sign of another underlying health issue. 7. RLS may be genetic: There are known to be 2 types of RLS. One of them is genetic. Learn about your family’s health history and ask around. You may find that your condition is something your grandmother had that she couldn’t explain. The genetic RLS symptoms usually begin much earlier in life, while the other type of RLS begins to appear as you age. 8. Most of the symptoms are at night: This is not just because of the fact that you are laying down at rest. This is due to the dopamine that flows through the body during certain parts of the sleeping and waking cycle. This is why some of the prescription medications are dopaminagen agents, whch are made to regulate dopamine activity in the body. Scientists are learning about the connection between the dopamine activity in the brain and restless legs but there is still much to learn. 9. RLS is not a form of Parkinson’s Disease: There are so many symptoms RLS can display, however, this is mostly because of the medication used to treat RLS symptoms. People often will commonly confuse this disorder with other more serious nerve conditions. 10. RLS is difficult to diagnose: It can mimic other things but a physician can usually tell after a consultation and a simple questionnaire to rule out other conditions. There is however no actual medical test for RLS. If you are experiencing RLS symptoms and need to come up with a quick solution due to the severity of your symptoms, it cannot be stressed enough that what you eat is likely directly influencing the severity of your symptoms RLS causes. Avoid the major allergen/sensitivity foods that are known RLS triggers such as dairy, salty foods and mono-sodium glutamate. Make sure you are also eating enough foods to be high in iron, magnesium and folic acid in order to nourish your body and find a supplement that contains these nutrients. The eBook that comes as an instant download with your order of Seratame is called “How to End RLS Naturally” and outlines the critical diet and lifestyle changes you can make immediately to start seeing results today.